French president polls at 20% approval, the lowest since 1958, while National Front leads in EU Parliament election poll. French far-right leader Marine Le Pen vowed to use next year's local and European elections as a springboard to national office as she addressed party faithful in Paris on Sunday. And as another poll showed President Francois Hollande's approval rating hitting record lows, Le Pen said the French leader had lost all credibility and urged him to hold early elections. 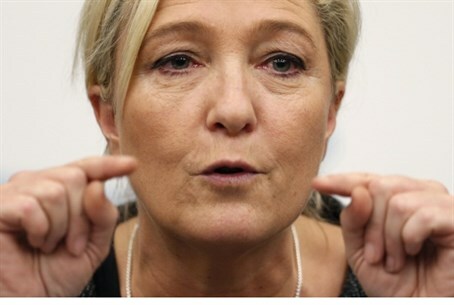 Le Pen, who shocked observers by taking 18 percent of the vote in the first round of last year's presidential election, has vowed to bring her National Front (FN) party into the mainstream and shed its image as racist. Opinion polls have shown the nationalist FN leading among voters for May's elections to the European Parliament and expected to take around 16 percent of the vote in local elections in March. The party's program, she said, would focus on strengthening the police, reducing local taxes and bureaucracy, and increasing the number of referendums on local issues. The FN will look to show the French it "knows how to manage" local bodies and prove it can be a "real alternative... on the national level", she said. Le Pen is also leading efforts to form an anti-EU bloc of right-wing Euroskeptic parties in the European parliament, along with anti-Islamic Dutch politician Geert Wilders. Those efforts received a setback after a right-wing Danish party refused to join the bloc, citing concerns over Len Pen's party's anti-Semitic record. Support for the FN has surged as Hollande's Socialist government struggles with a stagnant economy and growing anger over spending cuts and tax hikes. An IFOP poll released Sunday showed Hollande's approval rating falling three points in a month to 20 percent – the lowest number since the firm began polling on presidential popularity in 1958. The previous record had been held by Francois Mitterrand, whose approval rating fell to 22 percent in December 1991. "If Francois Hollande was up to his office, he would commit immediately to dissolving the National Assembly," Le Pen said. "Only by returning to the ballot boxes, only by returning to the people, can we come out on top of this crisis." Founded by Le Pen's father Jean-Marie, the FN has struggled for years to move beyond a devoted core of supporters and been regularly painted as racist. Jean-Marie Le Pen has been convicted of racism or anti-Semitism several times. In the latest controversy, the FN dropped a candidate for the 2014 municipal vote who compared the country's most prominent black politician, Justice Minister Christiane Taubira, to a monkey, saying she would prefer to see Taubira "in a tree swinging from the branches rather than in government".